BGen James LukemanAlfred M. Gray, Jr. The U.S. 2nd Marine Division is a division of the United States Marine Corps, which forms the ground combat element of the II Marine Expeditionary Force. The division is based at Marine Corps Base Camp Lejeune, North Carolina and headquartered at Julian C. Smith Hall. The regiments of the Second Marine Division were formed before the outbreak of World War I. The 2nd Marine Regiment was formed as the 1st Advance Base Regiment in Philadelphia, Pennsylvania on 19 June 1913. After actions including Vera Cruz and Haiti, the regiment was redesignated the 2nd Marine Regiment on 1 July 1916. The 6th Marine Regiment was formed at Marine Corps Base Quantico, Virginia on 11 July 1917. It shipped over to France and became a part of the 4th Marine Brigade in late 1917. The 8th Marine Regiment was activated 9 October 1917 at Marine Corps Base Quantico, Virginia. The 10th Marine Regiment was formed up at Marine Corps Base Quantico, Virginia on 25 April 1914 and is the longest serving Marine regiment of unbroken service of all Marine regiments. The 6th Marine Regiment was dispatched to France during late 1917 to early 1918. There, they were formed up with the 5th Marine Regiment and the 6th Machine Gun Battalion to create the 4th Marine Brigade. This brigade was attached to the 2nd Infantry Division. They participated in many of the final battles of World War I including the Aisne Defensive, Battle of Belleau Wood, Battle of Château-Thierry (1918), Battle of Saint-Mihiel, Battle of Blanc Mont Ridge, and the Meuse-Argonne offensive. Because the marines of the 4th Marine Brigade were aggressive in both defense as well as offense during the Battle of Belleau Wood, the Germans held a very high opinion of them. In recognition of these achievements, the woods were renamed "Bois de la Brigade de Marine. In addition, the legend of the marines getting their nickname "Devil Dogs" also occurred during this battle. For recognition of their many battle accomplishments, the marines of the 5th Marine Regiment, 6th Marine Regiment, and 6th Machine Gun Battalion were awarded the French croix de guerre three times. As a result, these units are authorized to wear the fourragère of the croix de guerre (seen in the unit's logo). The fourragère thereafter became part of the uniform of these units, and all members of the modern 5th and 6th Marine Regiments are authorized to wear the fourragère while serving with the regiment. 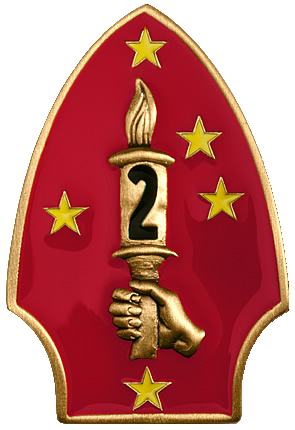 The 2nd Marine Division was officially organized on 1 February 1941 at Camp Elliott, California by change of designation from the 2nd Marine Brigade. By mid-1941, because of the growing threat of a German invasion to Iceland, the 6th Marine Regiment, a battalion from 10th Marines and other scattered units were pulled from the division and sent to garrison Reykjavík. After the outbreak of war the 8th Marine Regiment with an assortment of other division assets formed the 2nd Marine Brigade and were dispatched to garrison American Samoa. The Battle of Guadalcanal, in the Solomon Islands campaign – 4 January to 8 February 1943. The Battle of Tinian, – 24 July to 10 August 1944. The 2nd Marine Division was awarded the Presidential Unit Citation for Tarawa Atoll, Gilbert Islands, 20 –24 November 1943: "For outstanding performance in combat during the seizure and occupation of the Japanese-held Atoll of Tarawa, Gilbert Islands, November 20 to 24, 1943. Forced by the treacherous coral reefs to disembark from their landing craft hundreds of yards off the beach, the Second Marine Division (Reinforced) became a highly vulnerable target for devastating Japanese fire. Dauntlessly advancing in spite of rapidly mounting losses, the Marines fought a gallant battle against crushing odds, clearing the limited beachheads of snipers and machine guns, reducing powerfully fortified enemy positions and completely annihilating the fanatically determined and strongly entrenched Japanese forces. By the successful occupation of Tarawa, the Second Marine Division (Reinforced) has provided our forces with highly strategic and important air and land bases from which to continue future operations against the enemy; by the valiant fighting spirit of these men, their heroic fortitude under punishing fire and their relentless perseverance in waging this epic battle in the Central Pacific, they have upheld the finest traditions of the United States Naval Service." The scarlet and gold spearhead-shaped shoulder patch was designed and authorized in late 1943 for wear by 2nd Marine Division units serving in the Pacific Theater. The patch centers on a hand holding a torch, with the stars of the Southern Cross constellation as a reference to Guadalcanal. ↑ Heritage Years: Second Marine Division, 1940–1999. Turner Publishing Company. p. 21. ISBN 1-56311-501-8. http://books.google.com/books?id=O-ItIdrk7pAC&pg=PA21&dq=%222nd+marine+division+insignia%22#v=onepage&q=&f=false. ↑ Russell, Lee (1984). The US Marine Corps since 1945. Osprey Publishing. p. 38. ISBN 0-85045-574-X. http://books.google.com/books?id=k3xHRQPzeBoC&pg=PA38&dq#v=onepage&q=&f=false. ↑ "Marine Corps Base Camp Lejeune". http://www.marines.mil/unit/mcblejeune/PublishingImages/WebImages/Global/mcb_logo.png. Retrieved 4 December 2009. ↑ "Lineage of the 2nd Marine Division". 2nd Marine Division Association. http://www.2marine.com/ww2awards.html. Retrieved 8 June 2008. Crawford, Danny J.; Robert V. Aquilina, Ann A. Ferrante, Lena M. Kaljot, and Shelia P. Gramblin (2001). "The 2d Marine Division and Its Regiments". History & Museams Division. United States Marine Corps. Archived from the original on 11 December 2008. http://web.archive.org/web/20081211050919/http://www.marines.mil/news/publications/Pages/2D%20MARINE%20DIVISION%20AND%20ITand%2039;S%20REGIMENTS.aspx. Retrieved 3 December 2008.